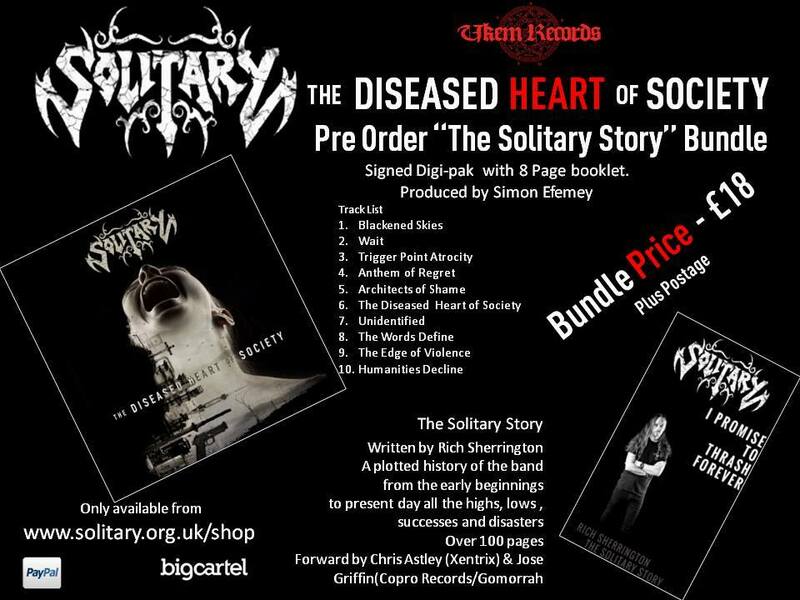 Home » News » Solitary Announce The Diseased Heart Of Society Album Details! Solitary Announce The Diseased Heart Of Society Album Details! Read our review of the thrash metal maelstrom that is “Unidentified” here! “Unidentified” is just one of nine monster tracks that together will set new standards for UK thrash. Renowned producer Simon Efemey (Amorphis, Paradise Lost, Napalm Death etc) worked with Solitary on The Diseased Heart Of Society to ensure that it delivers nothing less than total thrash destruction. Pre-orders for the album are open now with both the band and label offering some exclusive package deals. Solitary will be heading up to Scotland and over to mainland Europe for a series of live dates to support the album release – full details to follow shortly – as well as playing at the already sold out Hammerfest, 23rd – 26th of March and joining forces with Acid Reign and Shrapnel for a thrash spectacular in London, at the Camden Underworld on April 8th. UK Thrashers Virus Announce New Line Up! 5 Reasons Why The Return Of Acid Reign Is The Best Thing We’ve Heard This Year! The Kings Of Apple Core Return....It's Gonna Be Juicy! Worship Metal Celebrates 30 Years Of History Of A Time To Come….The UK’s Greatest Ever Thrash Album!